Other names: Spicate Eugenia, Kelat Nenasi, bhedas, sagarabatua. Marungi is a native of the Indian sub-continent. It is found growing wild in the Indian states of Maharashtra, Karnataka, Kerala, Orissa and the Andaman Islands. It bears sweet aromatic edible fruits. It also grows in South East Asia. Leaves aromatically fragrant when bruised, coriaceous, variable, 4-10 cm by 2-4 cm, ovate elliptic to linear-lanceolate, usually cadate acuminate, smooth and shining on both surfaces, paler and minutely glandular beneath, the margins slightly recurved, base acute; petiole2-6 mm long. Flowers white, conspicuous, in axillary and in axillary and many flowered terminal many-flowered paniculate cymes, in clusters of 3-5 at the end of the ultimate cyme branches; calyx funnel shaped, 5 mm long, tubercled with glands on the outside, sessile or nearly so; lobes, 4-5, broadly ovate or rotundate, concave, erect; petals, 4-5, orbicular, usually calyptrate but sometimes imperfectly so. Fruit pisiform, 5 mm wide, white, 1 seeded. The fruit is sweet, aromatic and edible. The plant is reported to be stimulant and antirheumatic. A decoction of the leaves and roots is used as a vermifuge. The bark is a source of black dye. The wood is reddish or brown. It is used for rafts, farm implements and construction. 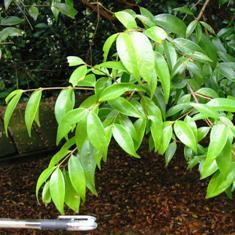 Marungi is suitable for planting in gardens as it is a handsome tree and looks exceptionally showy at the time of lowering. 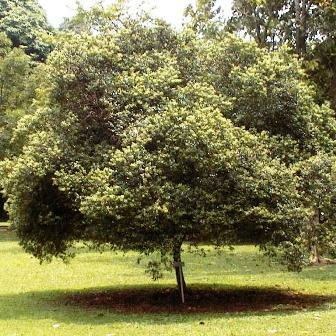 It is a multipurpose tree species can also be planted under other tree planting projects. New plants of marungi can be raised from seed.